Microsoft on Tuesday unveiled the Surface Book, what it's calling "the ultimate laptop." Microsoft came to its latest press conference on Tuesday armed with more than a few announcements. But none shook the tech world quite like the news that Windows creator was entering the notebook market. After concluding the announcement of the new, slimmer and more powerful Microsoft Surface Pro 4 tablet, Surface creator Panos Panay teased audiences with a new addition to the Surface family — a device performs like a tablet and a notebook computer. "We made the ultimate laptop," Payan said. "This is the fastest 13-inch laptop ever made, anywhere, on any planet." The screen for the notebook detaches from the device body's "dynamic fulcrum hinge" to become a standard Surface tablet, and can be flipped around to become a clip board. 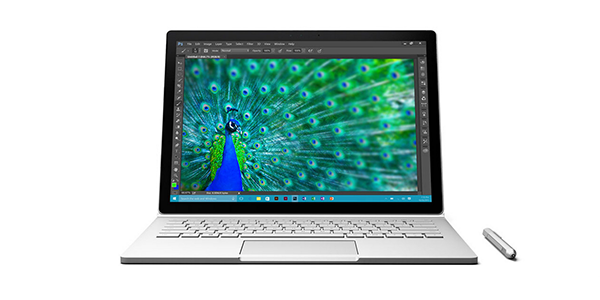 The Surface Book is powered by Intel Core i5 and i7 processors, and the base includes a Nvidia GeForce GPU with GDDR5 memory for powerful graphics processing. The device ships Oct. 26 with a starting price of $1,499.